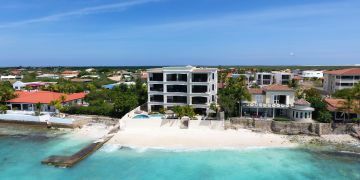 Elegancia del Caribe is conveniently located along the boulevard at the Kralendijk bay where sailing yachts moor in the quiet waters of the Caribbean Sea. 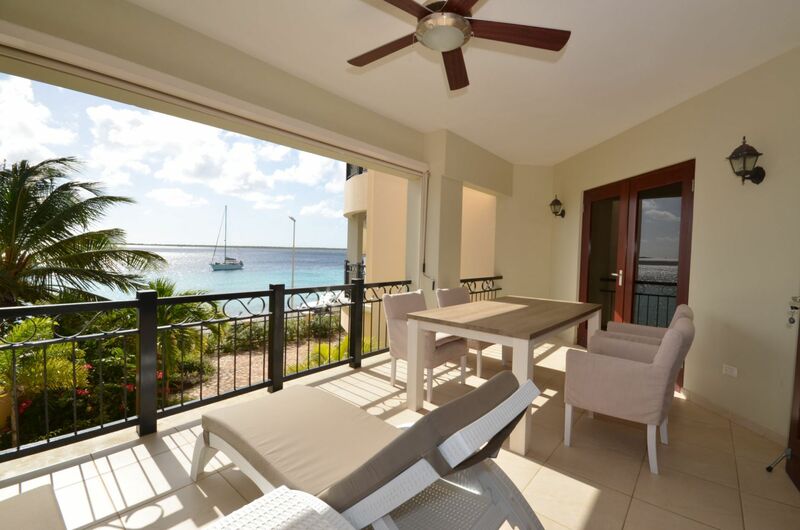 All apartments are seafront and fully furnished for a great vacation, be it for diving, surfing, snorkeling or just relaxing.To cool down; just jump into the swimming pool or relax at the large pool deck. Elegancia del Caribe is perfect for divers and not only because of its location. It also offers a rinse tank and a storage room on the premises. Your car can be parked on the gated parking lot in front of the building. This corner unit in the South building on the 2nd floor has been totally refurnished in 2015 and has a classy atmosphere with its beige and light blue furnishing. 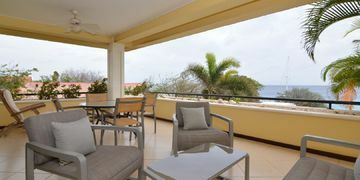 To enjoy the stunning views, you can lie down on the lounge beds on the spacious square-sized balcony. The living room is very inviting for those lazy hours to watch television in the comfortable lounge area. You can choose to have diner inside or ‘al fresco’ on the covered terrace where you will find a second dining table. The lay out of this condo offers maximum privacy for all guests staying in this unit. The master bedroom, with king size bed, has a private bathroom (double sink, shower & toilet) while the second bedroom, with queen size bed that can be converted into two twins, has a bathroom( single sink, shower & toilet) which is also accessible from the hallway. Both bedrooms have air conditioning & ceiling fans, offer 100% cotton sheets for that luxury feel and have plenty of towels in one of the many closets. The open concept kitchen is equipped with all appliances you can ask for. The laundry room is equipped with a European style washing machine.